Recently I wrote a post about the right we have to speak into public debate, and concluded that the more we are impacted by an issue, the more ‘standing’ we have to speak about it. 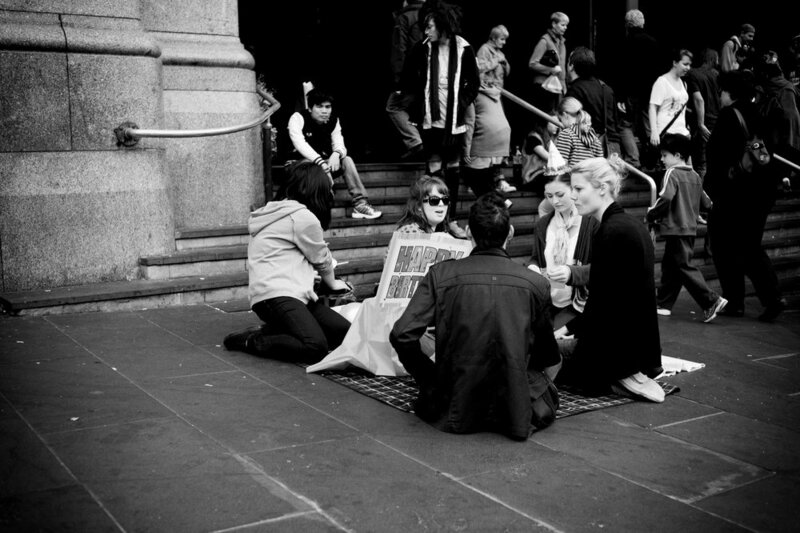 My musings have come out of some work I have been doing trying to organise to stop the City of Melbourne passing by-laws that will ban rough sleeping. I want to reflect specifically about this issue now, and the standing with which I feel I can (or should) activate on this issue. I want to begin by thinking about the street, and the kind of space that it is. One way we can think of the street is as an essential part of the ‘urban commons’. Traditionally in England the ‘commons’ were open areas within communities that were shared by many people: to graze livestock, to farm crops if you didn’t have land of your own. In a similar way, the streets are shared by many different people doing many different things: walking, driving, busking, socialising, selling, buying. The streets are a resource shared by many. The commons work when there are shared ways of managing them – otherwise, some people might take more than their fair share and not leave enough for others: a problem known as “the tragedy of the commons”. Noble Prize-winner Elinor Ostrom argued that a system of checks and balances must be in place for the ‘commons’ to be sustained. In the case of the street, the space is managed largely by state and local governments, who set laws and have the power to enforce them, as well as a level of self-managing by users who negotiate the space between themselves. The question then is: What rules will be set in place to govern who gets to use this collective resource and how? At some point a balance needs to be struck: between those traveling, those singing, those protesting, those trading, those sleeping. There is no objectively-sound way of doing this – invariably some people and users will be privileged over others. This is because rule-makers share the commons as well, and can’t be objective. Right now, in Melbourne, the local government rule-makers have decided that they do not want some types of street users: specifically, they do not want people who are needing to use the street for sleeping. Their claim is that they are attempting to balance the needs of all users, because the streets are becoming cluttered and unsafe due to rough sleepers taking up too much room. There is some validity in this: a balance does need to be struck between pedestrians (particularly those who are not able-bodied) and people sleeping out due to homelessness. But local government is attempting to strike disproportionately at only one set of users: the people who have been most dramatically failed by our community, such that they are forced to endure the indignity of homelessness. This is a curtailing of access to the commons, and one that is reminiscent of the ‘enclosures’ that saw the end of the commons in England, which privatised once-public land and shut out the users who needed it most, creating a class of landless workers. Where is my standing to speak on this issue? As a member of the Melbourne community, I am a user of the commons, and as such I want to live in a city with an urban commons that is as open and generous as possible. If our streets become places where some people are not welcome because they are in too much need, then this is indicative of a society that has lost both its heart and its perspective. Today I have a bed in an apartment, but tomorrow may be different. Tomorrow I might need to draw from the commons of the street in order to sleep, or maybe it will be a friend. Banning rough sleeping takes away my right to use a common resource, and yours too. This is my standing to speak out on this issue. Having said that, I still think that some people are closer to this issue than I am (because they have been or are homeless), and that it is important to prioritise their voices and act in solidarity with them. The organised voice of the homeless community in Melbourne, the Homeless Persons Union of Victoria, has been incredibly vocal against these by-laws, and similarly many individuals with lived experience of homelessness have spoken out against them. While consensus amongst such a diverse and disparate group is not possible, it is safe to say that on this issue at least there is widespread agreement that these by-laws are bad. I stand in solidarity with these voices. An important dimension to being a good ally is proximity to the people you purport to be prioritising. Otherwise, how do you know you’ve got it right? This is something I am working on right now: being responsive to people on the street especially when they try to engage with me; finding mutual spaces where we can converse. I find this is a constant challenge, because my life often tugs me away from people experiencing marginalisation, and towards people who hold more privilege. I believe I have standing to speak into the public conversation about whether people needing to sleep rough have a right to use the street, because I am also a stakeholder in the ‘urban commons’ that the street represents. I want these commons to be as open and generous as possible, because I want them to be available for myself and my community when we need them. Yet I also recognise that some people have more standing than myself to speak into this issue, because they have direct experience of homelessness. My goal and my desire is to speak in solidarity with them. Do you agree that everybody should have a right to use our ‘urban commons’ to sleep, if they need it? What standing do you have, to speak into this issue? Receive email updates when I post something new.